This condo has been totally renovated all new KITCHEN, Baths and New Floors. The entire condo has been freshly painted (walls, ceiling and trim), new sofa, loveseat and chair, new window treatments, new lighting new beds and bedroom furniture, new dishes, pots, pans, etc. Maravilla is the one of most popular family resorts in Destin! Our 2 bedroom is located in the very popular, family-friendly resort, Maravilla. It is open and airy with an extra-large balcony off the living room and master bedrooms. You will love the white sand beach that is just footsteps away. You will be pleasantly surprised by all the 'extras' in our home that you would not normally find in a rental unit. No need to pack up your porta-crib, high chair, or sand toys, we have them all! Our large second floor condo is a great place for a family to use alone or to share with friends. The Master suite has a King size bed with Egyptian cotton sheets, night stands, reading lamps, and HDTV. There is a sliding glass door with an attached balcony off the master bedroom. The sliding doors have custom room darkening drapes (so you can sleep in or take an afternoon nap while on your vacation). The attached full bathroom has a tub/shower combination, hair dryer and large fluffy bath towels. The 2nd bedroom has a Queen-size bed, with Egyptian cotton sheets, night stands, reading lamps, HDTV. The second bathroom is easily accessible from the hall and features a tub/shower combination, hair dryer and large fluffy bath towels. In our main living area we have a very comfortable queen size sofa sleeper, loveseat and side chair with reading lamps nearby. We also have an HDTV with digital cable channels, a DVD player and an iPod docking station stereo. Our kitchen is also fully equipped with a coffee maker, a blender that will grind all of your ice for frozen drinks, and a toaster. Also we have more than 12 plates, glasses, forks, etc. so you don't have to wash your breakfast dishes before you eat lunch. And plenty of pots and pans so you can easily cook anything you need. The Dining area features a table and chairs and a breakfast bar with chairs. For your convenience, we also have a washer and dryer, and iron and ironing board. And if you would like to keep up with friends, family or work while you are away, we provide free high-speed internet and WIFI. Maravilla is the one of the most popular family resorts in Destin. It’s a low-density resort (only 4 stories which means fewer people on the beach!) It has a 2-acre PRIVATE beach and plenty of green space for the kids to run and play safely. Maravilla also features two swimming pools (one heated), a hot tub, BBQ grills, tennis courts, shuffleboard, and a basket-ball hoop. 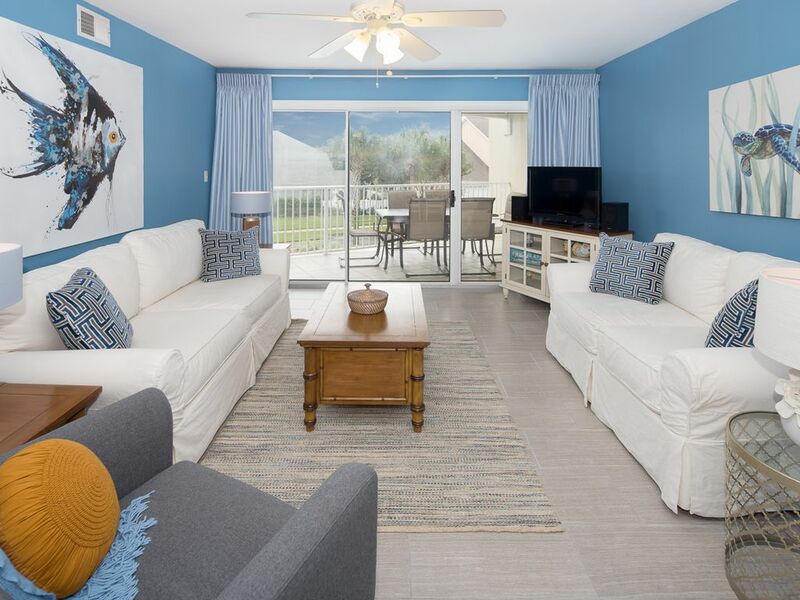 Centrally located on Scenic Gulf Drive (near the outlet mall and Pompono Joe's), it is very close to local attractions, restaurants, and shopping. Be sure to check our calendars because they are always up-to-date, if this one is booked, check our other condo, right next-door. See VRBO listing # 3755. Call or e-mail now for this lovely vacation rental. We purchased our condo in Destin because we wanted a place for our family to gather and build fond family memories. We love Maravilla so much that when the condo right next door came up for sale, we decided to purchase another one! We live in Austin, Texas now (we bought our Marvailla Condo when we lived in Atlanta, GA.) While living in Atlanta we would visit Destin every chance we could. Now that we are much further away, we have to plan our trips. But are looking forward to retiring in Destin someday! While it may not be your deciding factor when you are choosing places to rent, you will appreciate it once you get here. Most everything you’ll need during your stay is here! Our guests who stay with us comment on how well equipped our condo is. Because we live so far away, we take special care to make sure everything is in perfect condition. It’s imperative that we have the best help there in Destin. We employ a housekeeper who only cleans for a couple of people. We do not use one of those massive cleaning companies who dash in and out of the condo in 15 minutes and call it clean. Our housekeeper takes hours to clean our condo (yes the cleaning fee is $10-$20 more than you’d pay with others but we ensure it’ll be really clean!) Every time we visit our condo, we are constantly upgrading! Come and stay with us and I can assure you’ll be happy! We're on the second floor in the building on the right hand side as you are looking at the complex from the beach. Complex is Beach Front. Maravilla owns the private, undeveloped beach. We're a low density complex so our beach will not be as crowded as you would find in other complexes. It's just a short walk (about 150 yards) from our doorstep to the water's edge. Our family enjoyed our stay in Miramar Beach and appreciated the extra care that Sugar Palm Rentals took to make our stay in their condo all the more enjoyable (the welcome donuts from The Donut Hole was a very nice surprise!). The condo was nicely decorated and updated and in a great location to the beach, shops, and restaurants. Our dogs loved going out onto our private outdoor patio to watch the outdoor activity and loved going for their long walks along Scenic Blvd. We would definitely rent from Sugar Palms again! The condo was clean and well-equipped. Little things like extra blankets on the couch and coffee filters in the cabinet were awesome. Although not on the beach, a very easy walk to the private beach. Very comfortable and we would book again. Condo was so comfortable and very beachy! It had everything that we could ask for! Will definitely be staying again. A wonderful size for family of three or four. This place is amazing. It's only a short walk to the beach (however, you CANNOT see the ocean). It has great pools. They give you two chairs at the beach. This place was the most equipped with things (kitchen supplies, towels, etc) than anywhere we've ever stayed. We stay somewhere different every year, but we will definitely be back here! Everyone has dogs and cats there and it's very family friendly, but the place did not smell like a pet had ever graced the door. The bed in the master bedroom is the most comfortable bed we've ever slept in. My busybody husband spent about 4 hours a day just laying and watching TV. There are games in the table. Every room is remodeled and new. The place was EXTREMELY clean. It is close to many places (including a GREAT escape room). They seemed to have thought of everything with the vacationer in mind. It was amazing and relaxing. Words can't describe it. You'll have to see for yourself! (The second room was a lot smaller, but it was the other couple's turn for the smaller room. Ha!) We made breakfast every day and ate at wonderful places after a day at the beach. They have a book with suggestions for restaurants. Read it before you go, and not on the last day like we did! The condo was beautifully remodeled and decorated! I loved the fact there was no carpet! It made it very easy to clean! The location was superb. Most of the area directly around Maravilla are homes, so the beach was not overcrowded at all! The walk to the beach was quick and easy! Perfection, perfection, perfection! Our new favorite spot!